The deltoids (your shoulder muscles which can be divided into three sections, anterior, lateral and, posterior or in English the front, middle and back). If you have any questions regarding these techniques and how to get the most out of them, I highly recommend that you check out 7 Seconds to a Perfect Body - my complete isometric program. Outstanding forearms that will increase your grip strength. Sit on a kitchen chair. As you do so concentrate on making your forearms as tight and hard as possible. After a few seconds you should feel you’re fingers and forearms getting very tired and even shaking all over – this is the individual muscle fibres exhausting themselves as they work really hard – this is Isometrics. Find something so heavy you can’t move it a fixed table of window sill is ideal for this. 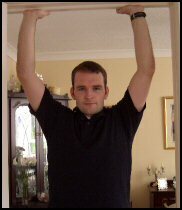 Stand in front of it and place your hands palm up underneath the immovable object about shoulder width apart. Ideally the object should be at just below chest level or on it. Slowly tense the arms as though trying to bring the object under your chin. After a few seconds your biceps should be bulging and shaking – this is the individual muscle fibres exhausting themselves as they work really hard – this is Isometrics. Stand in front of a table, chair or step facing away from it. Mid way hold this position and tense the triceps as though trying to straighten the arms. Congratulations! You've just finished Arm Exercise Isometrics. If you’ve followed the above Arm Exercise Isometrics routine it should have taken no longer than 2 minutes and you have just done a complete arm workout! Your arms should feel warm (maybe slightly stiff if this is your first time), relaxed and powerful.